eye gnats - Liohippelates spp. Members of the genus Liohippelates, formerly Hippelates, are very small true flies and a common occurrence in much of North and South America (Sabrosky 1980, Kumm 1935). These non-biting pests are attracted to fluids secreted by the eyes, nose and ears on both humans and animals. Some species are attracted to discharge from open wounds and excrement (Goddard 2007). Because of their propensity for hovering around the eyes, this genus has been referred to commonly as eye gnats, but are also known as grass flies, eye flies, and frit flies. Figure 1. Lateral view of an adult Liohippelates sp., from a horse farm in north central Florida. Photograph by Lyle J. Buss, University of Florida. Extremely large aggregations of eye gnats are common in areas that have loose sandy soils, especially in the southern United States. These high concentrations of flies are a great nuisance to humans and animals in rural towns as well as agricultural, recreational and tourist areas. While they do not bite, Liohippelates spp. have been implicated in the transmission of several diseases to humans and livestock including human acute conjunctivitis (pink eye). Due to the increase of transmission of pink eye and the reduction in labor efficiency caused by extreme numbers of eye gnats in the Coachella Valley, California, a control project was initiated by the Bureau of Entomology in the 1920s to focus on the life history and possible control measures for this pest. Hall (1932) subsequently implicated Liohippelates pusio (Loew) as one of the limiting factors in the development of the Coachella Valley. 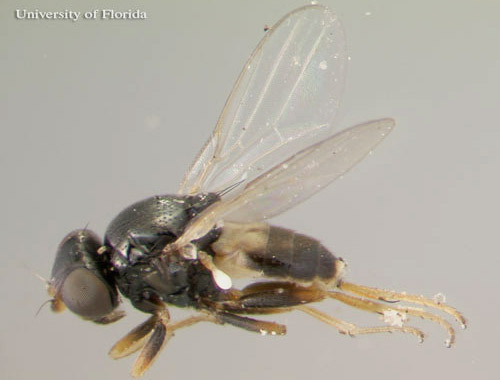 The majority of the flies encountered in the southeastern region of the United States are Liohippelates pusio and Liohippelates bishoppi (Sabrosky), and as a result the biological information below will focus broadly on these two species. Lioppelates pusio was first named Hippelates pusio by Loew in 1872, and Liohippelates bishoppi was described by Sabrosky as Hippelates bishoppi in 1941. 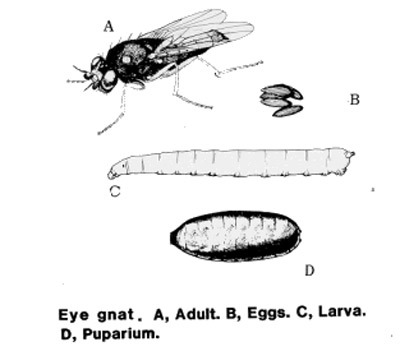 In 1929, Duda described the genus Liohippelates, which now contains the most important common species of eye gnats in the southeastern United States including what was Hippelates pusio and Hippelates bishoppi. Both Liohippelates spp. and closely related Hippelates spp. occur throughout much of North America (Sabrosky 1941) and 270 species have been described (Sabrosky 1987). Bingham (1941) determined during his investigations of Liohippelates in the southeastern U.S. that Liohippelates pusio was the most common pest of this genus. Later that year, Sabrosky (1941) found and described a new species, Liohippelates bishoppi, misidentified by Bingham as Liohippelates pusio, which made up a moderate portion of the southeastern Liohippelates. Liohippelates bishoppi is found from February through September and Liohippelates pusio year round. Liohippelates pusio can be found from Washington to North Dakota, south to Pennsylvania, as well as California south to Mexico and east to the southeastern United States and Bermuda (GNI 2010). Liohippelates bishoppi is found from Saskatchewan to Quebec, south to Colorado, Texas and Florida. Other Liohippelates species found in the southeastern and eastern U.S. are Liohippelates bicolor (Coquillett) and Liohippelates pallipes (Loew), whereas Hippelates species found in the same area include Hippelates nobilis Loew, Hippelates plebejus Loew, and Hippelates dorsalis Loew (Sabrosky 1941). 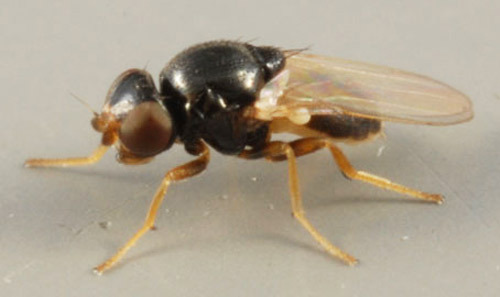 Adults: Adult Liohippelates are true flies (bearing only two wings) and are very small, approximately 1.5 to 2 mm long, and shiny black or grayish in color with clear wings. Some species have reddish or yellowish heads. Legs tend to be reddish-yellow to brown with brown bands (Hall 1932). Figure 2. Lateral view of an adult Liohippelates, unknown species. Photograph by Erika T. Machtinger, University of Florida. Eggs: The eggs of Liohippelates flies are a pearlescent white and approximately 0.5 mm long. They are half as wide (0.25 mm) as long , resembling a banana with one side curved and one nearly straight (Hall 1932). Eggs are deposited below the surface of loose soils. Larvae: The larvae hatch in seven to 11 days and feed on organic matter (Kahn 2008). The larvae average 3 mm in length and are a whitish color (Hermes and Burgess 1930). Larvae are pointed towards the anterior end and rounded towards the posterior. The mouth hook is darker than the rest of the body and curved gently downward. Pupae: The pupae are approximately 2.25 mm in length, depending on the media in which larvae developed and grew (Hall 1932), and a reddish-brown color, turning darker as they age. Liohippelates pupate in or around sand mixed with organic matter, such as manure, hay and remaining harvested crop debris. Figure 3. 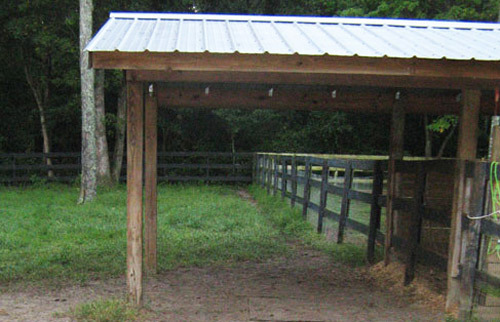 Primary Liohippelates breeding sites in Florida include loose soils with organic matter and moisture, as is found on many livestock facilities throughout the state. Photograph by Erika T. Machtinger, University of Florida. Liohippelates spp. are holometabolous, meaning they have four distinct life stages; egg, larvae, pupa and adult. The life cycle of Liohippelates can range from 11 days to three months depending on development conditions such as temperature and moisture (Hall 1932). Development from egg emergence to the adult is completed in approximately three weeks during the summer in Florida (Bigham 1941) and multiple generations can occur each year. Breeding sites are primarily those with freshly disturbed soil mixed with organic matter, such as cut grass and hay, and moisture. Disturbances can be caused by digging, plowing, harrowing, or even by livestock activities (Bigham 1941, Mulla 1962). Figure 4. Life cycle of Liohippelates species. 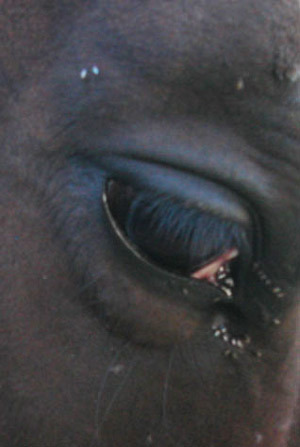 Liohippelates are not host specific and will feed on the fluid from wounds, eyes, nose, and other areas on humans as well as livestock and domestic pets in a variety of situations. While they do not bite, due to their persistent feeding behavior this group of insects is responsible for extreme annoyance to people and animals when they occur in large numbers. In livestock, it has been suggested that high numbers of Liohippelates can cause losses in condition, such as weight, due to continuous and unrelieved attack (Hinkle et al. 2001). Figure 5. Congregation of adult Liohippelates spp. around the eye of a horse. Photograph by Erika T. Machtinger, University of Florida. Many species of Liohippelates have been implicated in the mechanical transmission of several diseases and conditions in humans and livestock. Mechanical transmission of pathogens causing disease from Liohippelates to humans or livestock occurs when a fly comes in contact with a pathogen, such as a bacterium or virus, and subsequently feeds or rests on a human or animal, transmitting the pathogen from one location to another by contact. As feeding occurs on the blood, mucus, and other fluids around natural orifices of mammals, pathogens can be carried easily into the body. Human acute conjunctivitis, also known as "pink eye" or "sore eyes," is caused by one or more bacteria that can be mechanically transmitted by Liohippelates. Pink eye causes pain, swelling, changes in vision and extreme sensitivity to light (MIDEHA 2010). Incidents of conjunctivitis have been shown to increase during Liohippelates outbreaks (Dow and Hines 1957, Greenberg 1973). In California, Hall (1926) correlated pink eye to high populations of Lioppelates flavipes (Loew) . Liohippelates flavipes and Liohippelates pallipes have been shown to mechanically transmit the spirochete Treponema pertenue, the causative agent of yaws, in Jamaica and parts of South America (Kumm 1935, Kumm and Turner 1936, Saunders et al. 1936). Yaws is a skin infection that causes ulceration and, in severe cases, can affect bone and cartilage. Yaws occurs mainly in warm and humid regions of the world, including much of South America, and primarily affects children under the age of 15. 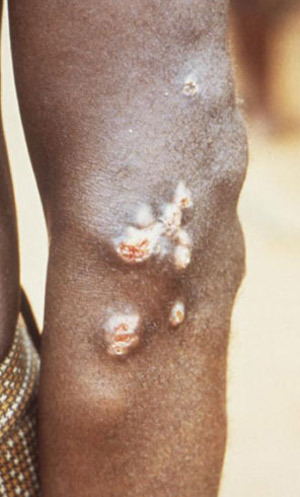 Yaws is especially common in poor communities and those in crowded conditions (DNZ 2010). Figure 6. This person has yaws with 8 month-old juxta-articular nodules on the left elbow. Photograph by Peter Perine, CDC. Another form of acute conjunctivitis caused by the bacterium Haemophilus influenzae biotype aegyptius has been linked to a few species of Liohippelates (Tendella et al. 1994). This bacterium has been linked to the cause of Brazilian purpuric fever, which causes sepsis in children (Harrison et al. 1989, The Brazilian Purpuric Fever Study Group 1992). Sepsis is a serious condition caused by extremely high numbers of foreign microbes in the bloodstream that results in hyperactivity of the body's natural immune response, negatively affecting other body functions. Additionally, Liohippelates is capable of mechanically transmitting streptococcal infections to human skin (Francy et al. 1988). While they do not bite or bloodfeed, Liohippelates possess sponging mouthparts with "spines" which have the potential to cause ocular lesions in animals (Hinkle et al. 2001). Two species of Hippelates found in Florida, Hippelates plebejus and Hippelates nobilis, are larger species with rasping mouthparts capable of producing a biting sensation when feeding on sensitive skin (Bigham 1941). Liohippelates has been implicated in mechanical transmission of pathogens between animals as well. In cattle, Liohippelates can transmit the causative agents of acute bovine mastitis (Sanders 1940) and vesicular stomatitis (Taplin et al. 1967). Acute bovine mastitis is inflammation of the mammary glands, primarily caused by bacterial infection, which can be extremely painful and compromise milk quality. Mastitis may also cause death in extreme cases (Bradley 2002). Treatment for mastitis includes the use of antibiotics, which has possible implications in public health as resistant bacterial strains may not respond to treatment (Bradley 2002) and milk from treated cattle cannot be sold for human consumption until the required withholding time has elapsed. Vesicular stomatitis is a reemerging viral disease that presents as lesions on the tongue, coronary bands and other body regions of cattle as well as horses, sheep, goats and pigs (USDA 2007). This disease is remarkably similar in presentation to the deadly foot-and-mouth disease, which was eradicated from the United States in 1929 (USDA 2007) and infection can transfer to people who handle infected animals. Figure 7. Congregation of adult Liohippelates around the puncture wound of a horse. Photograph by Erika T. Machtinger, University of Florida. Currently, there is no effective area-wide control. Various insecticides, fogs, and soil treatments have been tested, but due to the incredible numbers of flies produced in the soil, area-wide treatment is nearly impossible. Insecticides applied on a community level for mosquito control may reduce attack, but development sites quickly repopulate as the insecticide dissipates (Kahn 2008). Physical barriers, such as screened porches and windows on houses and fly masks or fly sheets (which resemble a fine cloth mesh, largely impenetrable by even the smallest pests) on livestock , can provide some relief from annoyance and protection from possible pathogen transmission. Sanitation methods to eliminate potential breeding sites, such as reducing manure and organic matter in soil and reducing loose soil matter, may reduce breeding at the location. However, often reducing Liohippelates and Hippelates breeding sites is nearly impossible in livestock facilities as manure, moisture and soil disturbance are inseparable from animals. Repellents containing diethyl toluamide (DEET) provide temporary protection from eye gnats (Hall and Gerhardt 2009), and many commercial livestock insecticides that contain pyrethrins, piperonyl butoxide or other common ingredients may provide some relief to animals. Bigham JT. 1941. Hippelates (eye gnats) investigations in the southeastern states. Journal of Economic Entomology 34: 439-444. (BPFSG) The Brazilian Purpuric Fever Study Group. 1992. Brazilian purpuric fever identified in a new region of Brazil. Journal of Infectious Disease 163: 516-519. Bradley A. 2002. Bovine mastitis: an evolving disease. The Veterinary Journal 164: 116-128. (DNZ) DermNet NZ. (January 2010). Yaws. DermNet NZ: the dermatology resource. http://dermnetnz.org/bacterial/yaws.html (28 February 2011). Dow RP, Hines JD. 1957. Conjunctivitis in southwest Georgia. Public Heath Reports 72: 441-448. Dow RP, Bigham JT, Sabrosky CW. 1951. Sequel to "Hippelates (eye gnat) investigations in the southeastern states" by John T. Bigham. Proceedings of the Entomological Society of Washington 53: 263-271. Francy DB, Moore LG, Smith GC, Jakob WL, Taylor SA, Calisher CH. 1988. Epizootic vesicular stomatitis in Colorado, 1982: Isolation of virus from insects collected along the northern Colorado Rocky Mountain Front Range. Journal of Medical Entomology 25: 343-347. (GNI) Global Names Index. (2010). Global Names Index - Index of Scientific Names. http://gni.globalnames.org/name_strings (28 February 2011). Goddard J. 2007. Non-biting Flies. pp. 191-200. In Physicians Guide to Arthropods of Medical Importance, 5th edition. CRC Press, Boca Raton, FL. 480 pp. Greenberg B. 1973. Flies and Disease. Vol. 2. Biology and Disease Transmission. Princeton University Press, Princeton, NJ. 856 pp. Hall RD, Gerhardt RR. 2009. Flies (Diptera). In Mullen Gr, Durden LA (editors), Medical and Veterinary Entomology, Second Edition. Elsevier, Burlington, MA. 637 pp. Hall Jr. DG. 1932. Some studies on the breeding media, development, and stages of the eye gnat Hippelates pusio Loew (Diptera: Chloropidae). American Journal of Epidemiology 16: 854-864. Harrison IH, Da Silva GA, Pitman M, Fleming DW, Vranjac A, Broome CV. 1989. Epidemiology and clinical spectrum of Brazilian purpuric fever. Journal of Clinical Microbiology 27: 599-604. Herms WB, Burgess, RW. 1930. A description of the immature stages of Hippelates pusio Loew and a brief account of its life history. Journal of Economic Entomology 23: 600-603. Hinkle NC, Scholl PJ, Mock DE and Warner WB. 2001. Research and extension needs for integrated pest management for arthropods of veterinary importance. pp. 261-262. In Geden CJ, Hogsette JA (editors), Proceedings of a workshop in Lincoln, Nebraska. Second Edition. 328 pp. (ITIS) (2010). Liohippelates. Integrated Taxanomic Information System. http://www.itis.gov/ (28 February 2011). Kahn C (ed.). (2008). Eye gnats. The Merck Veterinary Manual. http://www.merckvetmanual.com/mvm/index.jsp?cfile=htm/bc/71717.htm&word=hippelates (28 February 2011). Kumm HW. 1935. The natural infection of Hippelates pallipes Loew with the spirochete of yaws. Royal Society of Tropical Medicine and Hygiene 29: 265-272. Looper M, Stokes SR, Waldner DN, and Jordan ER. (2001). Feeding waste milk to dairy calves. New Mexico State University College of Agricultural, Consumer and Environmental Sciences. http://aces.nmsu.edu/pubs/_d/d-208.html (28 February 2011). (MIDEHA) Infectious Disease and Environmental Health Administration. (2010). Conjunctivitis ("Pink Eye"). Maryland Department of Health & Mental Hygiene. http://ideha.dhmh.maryland.gov/pdf/conjunctivitis.pdf (05 May 2011). Mulla MS. 1962. The breeding niches of Hippelates gnats. Annals of the Entomological Society of America 55: 389-393. Sabrosky CW. 1941. The Hippelates flies or eye gnats: preliminary notes. Canadian Entomologist 73: 23-27. Sabrosky CW. 1987. Chloropidae. pp. 1049-1067. In McAlpine JF, et al. (editors), Manual of Nearctic. Diptera. Volume 2. Research Branch Agriculture. Canada Monograph 28: 675-1332. Sanders DA. 1940. 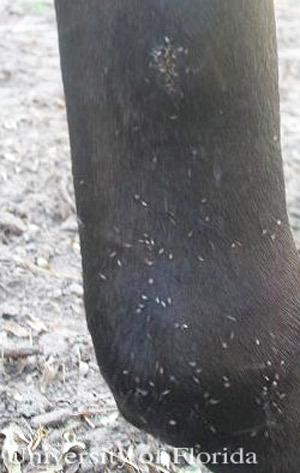 Hippelates flies as vectors of bovine mastitis (preliminary report). Journal of the American Veterinary Medical Association 97: 306-308. Saunders GM, Kumm HW, Rerrie JI. 1936. The relationship of certain environmental factors to the distribution of yaws in Jamaica. American Journal of Hygiene 23: 558-579. Taplin D, Zaias N, Rebell G. 1967. Infection by Hippelates flies. Lancet 2: 472. Tondella MLC, Paganelli CH, Bortoloho IM, Tankano OA, Trino K and Brandileone MCC. 1994. Isolamento de Harmophilus aegyptius associado a febre purpurica Brasileira de cloropideos (Diptera) dos generous Hippelates e Liohippelates. Revista do Instituto de Medicina Tropical de São Paulo 36: 105-109. (USDA) United States Department of Agriculture. (March 2007). Information about vesicular stomatitis for the beef producer. http://www.aphis.usda.gov/publications/animal_health/content/printable_version/fs_vesicular_stomatitis_07.pdf (06 May 2011). Publication Date: April 2011. Latest Revision: May 2011. Reviewed: November 2018.